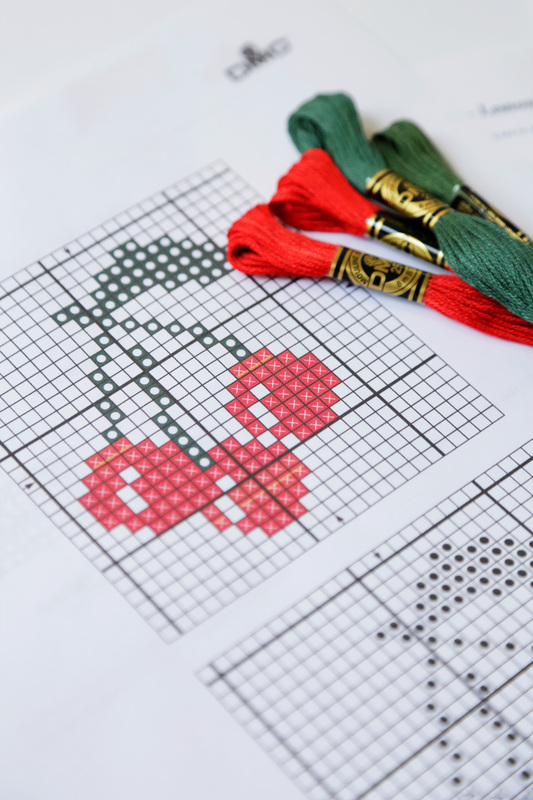 To create beautiful cross stitch designs, DMC recommends starting your stitching with one the methods described below. 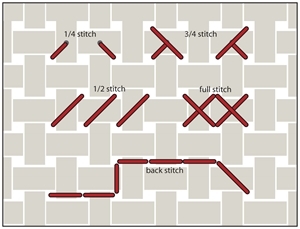 This “beginners” starting technique is best used to start a new design or to start stitching in a new area of the design. Knot the end of your thread and take your needle from the front to the back about 2.5cm (1”) or so from your starting point running the thread along the same line you plan to stitch. Bring the needle up to the front of the fabric at the starting point of your first cross stitch. Start stitching towards the knot, being sure to cross over the thread on the back with each stitch to secure it. 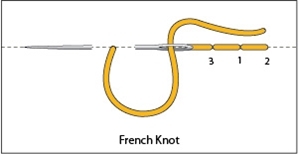 When your stitching reaches the knot, pull the knot up and clip it off close to the fabric and continue stitching. 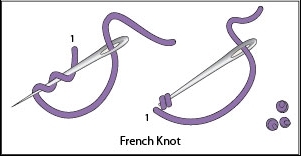 Another easy way to start a new design or to start stitching in a new area of the design is the Away Knot. Knot the end of the thread and take your needle from the front side onto the back several inches away from your starting point and start stitching. When you finish stitching with that thread, pull the knot up and clip it off. Turn your work over, re-thread the needle with the remaining thread and weave the thread through several stitches on the back to secure it. Pull your threaded needle up onto the front side of the fabric, leaving a 2.5cm (1”) end of thread on the back. Hold the end of thread against the back of the fabric in the direction you plan to stitch and work the first 4 to 5 stitches over it to secure it into place. Be sure to check the back to confirm that your stitches are covering the thread and clip any loose ends before continuing to stitch. Once you have started a project, you can secure new threads by weaving the thread under several adjacent stitches on the back and continue stitching. TIP: DMC recommends that you start stitching the design in the centre of the fabric and work outwards towards the edges. Beginners and all stitchers alike, it’s best to start in the centre and avoid a costly miscalculation only to find that you’ve run out of fabric to finish stitching the design. The cross stitch is worked in horizontal rows from left to right. To make a cross stitch bring the needle up at point 1, lower left hole of one square of the fabric and down at point 2, upper right hole of one square of the fabric. Bring your needle back up at 3 down at 4, up at 5 down at 6. Complete the row. 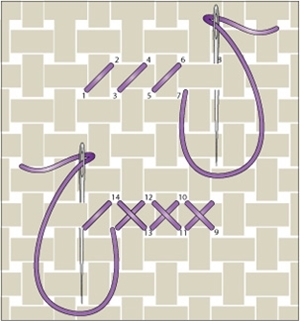 The return row is stitched right to left, make crosses by bringing the needle up at 9 and down at 10, up at 11 down at 12. Complete the return row and repeat the stitching sequence until the area is stitched as charted. When stitching make sure your stitches lie flat, if your thread becomes twisted while stitching, drop the needle and allow the needle to hang freely. The thread will untwist by itself. - Make sure all your stitches are crossed in the same direction. - Keep your tension and the stitches even while cross stitching the design. - Work the design area first and any plain background last. - Work the darker colours first, and the lighter colours last. - Sometimes you'll stitch only a few stitches in an area, than jump to another area with that same colour thread. Jumping can be easier than stopping and starting, but when you carry the thread along the back it can show through the fabric. Only carry thread to another area if the jump is short and the thread is a light colour. To end a thread, run your threaded needle under the last few stitches on the back of the fabric, and clip off the excess thread. After rethreading the needle to continue, simply run the needle under several stitches on the back to secure the thread and resume stitching. The half stitch is a simple diagonal stitch and is most commonly worked in horizontal rows. Usually when a design calls for a half stitch it is listed under a separate heading in the colour key and indicated on the chart by a diagonal coloured line. Some designers use half stitches in patterns sometimes as shading to create a sense of depth in a cross stitch picture. To stitch a half stitch, bring the needle up from the back of the fabric at 1, and down into 2. Up at 3 down at 4. Complete the row. The return row is stitched in reverse and stitched from the right to the left. Here the needle comes up at 11 and down at 12, then up at 13 and down at 14. 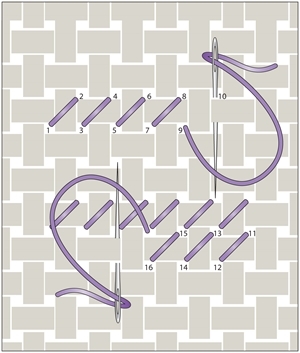 Complete the return row and repeat the stitching sequence until the area is stitched as charted. To stitch a quarter stitch, bring the needle up from the lower left hole of the square of the fabric and down into the centre of the square. Quarter stitches may be stitched from any corner of the Aida square. Tip: Use a smaller size needle when stitching quarter stitches. Do not pierce the fibres in the centre of the square. 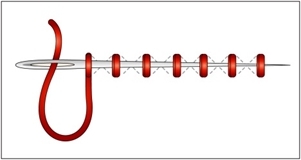 Wiggle the needle to shift the fibres and slip the needle between them. A three quarter stitch is most often done by stitching the short arm first, like a quarter stitch. It is completed with a half stitch to make the other two arms. To stitch a three-quarter stitch, first bring the needle up at the lower left hole of the square of the fabric and down into the upper right hole of the same square in the fabric. Next, bring the needle up at from the lower right hole of the square of the fabric and down into the middle of the half stitch you created. Three-quarter stitches may be stitched in any direction. TIP: To make fractional stitches on Aida fabric can be made somewhat easier by using a small sized needle (number 26 or number 28). The back stitch is worked from the right to the left. To start bring your needle up at 1 and back down at 2. Move left and bring needle up at 3 and back down at 1. Continue the stitching sequence. A line on your design chart indicates a back stitch is needed. When there is a symbol over a square, and the symbol is the same on both sides of the backstitch symbol, make a cross stitch in that square, then add the backstitch last. 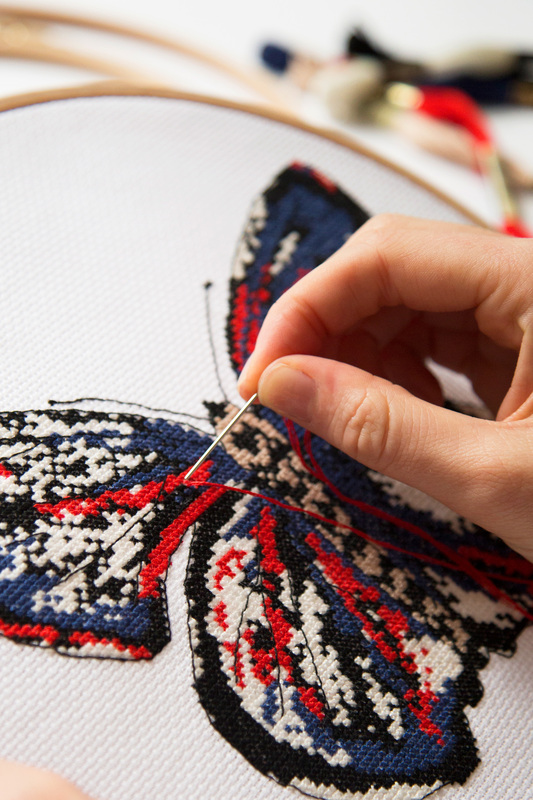 The French Knot is used in many counted cross stitch designs to add extra detail or dimension. To make a French Knot bring the needle up at 1. Hold your thread taut with the other hand and wrap the thread twice around the end of the needle. Gently pull the thread so that the wrapped threads tighten and while holding it taut, insert the needle next to 1. Pull thread through onto the back until the knot is formed and lies securely on the surface. A bold dot on your design chart indicates a French Knot is needed. TIP: To make a larger knot, wrap the thread around the needle a couple of extra times or use a thicker thread.